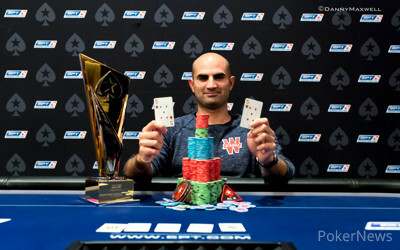 Sylvain Loosli Wins EPT Barcelona Super High Roller (€1,224,000)! Frenchman Sylvain Loosli started the final day of the 2015 PokerStars European Poker Tour Barcelona €50,000 Super High Roller seventh in chips, but he managed to come out victorious and take home the staggering €1,224,000 first-place prize. Loosli, who finished fourth in the World Series of Poker Main Event in 2011, defeated young Polish superstar Dzmitry Urbanovich heads up and jumped into fourth on the French all-time money list for live tournaments. The final day of the event started out with nine hopefuls, and the shortest of them all doubled up right away. Byron Kaverman came into the day with less than 10 big blinds, but even a quick double up couldn't turn the tide for the recent first-time WSOP gold bracelet winner. About an hour after he doubled, Kaverman busted in ninth place for €123,600 after he ran pocket nines into Ivan Luca's kings. The little he had left was lost two hands later. With eight players remaining and the official final table set, Loosli was the shortest stack. He doubled up immediately to get back into things with king-jack against Luca's ace-king, spiking a jack on the turn, and it started quite a run for him. Paul Newey wasn't as fortunate, busting shortly after when his queens fell to JC Alvarado's ace-king. Newey took home €168,700 for his eighth-place finish. Steve O'Dwyer couldn't get anything going on the final day, and a big flip that could've gotten him back into the thick of it sent him to the rail. O'Dwyer's jacks fell to Luca's ace-king suited when the board brought a king. O'Dwyer took home €221,000 for finishing in seventh place, and the field was left with six. Luca, the Argentinian youngster, showed no signs of slowing down at any part of the final table, but that likely led to his demise with him busting in sixth place. Luca shoved with pocket sixes over Urbanovich's raise, but the Polish star had two tens and called. Luca couldn't improve and was sent packing for €280,500. The start-of-the-day chip leader, Australian Michael Egan, busted in fifth place when he found himself all in with ace-ten against Urbanovich's ace-jack. Everything that went Egan's way on the penultimate day seemed to be reversed today, and he took home €358,900 for the biggest score of his live poker career. Alvarado was in control for most of the final table, even though Urbanovich knocked out two players in a row. However, right after the dinner break, with Urbanovich not even present at the table yet, Alvarado's stack crumbled. First, he shoved and Christoph Vogelsang called for less with pocket tens. The German doubled up against jack-seven, and one hand later Alvarado hit the rail. The Mexican pro shoved from the small blind with nine-four of hearts and Loosli knocked him out with ace-six. 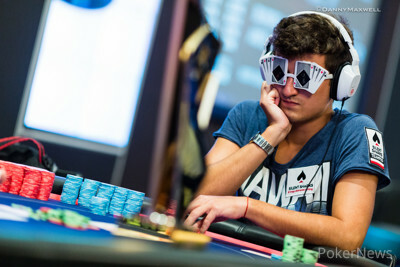 Alvarado took home €446,800 for his fourth-place finish, three years after finishing second in this event for €788,674. Three-handed play didn't take long, as Vogelsang jammed a gutshot draw on the flop in a battle with Loosli. The Frenchman had flopped two pair and didn't back down. Loosli won the pot, Vogelsang took home €551,485, and the heads-up battle started with near-even stacks. Loosli took a big lead right away, but Urbanovich doubled back up to make it into a match. However, the French pro never lost control, ultimately sealing the deal when his pocket fives held up against Urbanovich's jack-ten. For Urbanovich, the €841,500 runner-up score marked his sixth six-figure score of 2015 and brought his career total to $3.5 million — all but $160,000 of that he won this year. Loosli celebrated his win loudly with the large rail that had gathered to watch the final. This tournament proved the biggest victory of his poker career and second seven-figure score. Down to just 5.1 million (almost 13 big blinds), Dzmitry Urbanovich pushed all in from the button. Sylvain Loosli made the call instantly. The crowd, at least a hundred people were watching the match from the rail, all got up and collectively held their breath. The dealer silently dealt , a good flop for Loosli, but the former November Niner wasn't home safe just yet. The crowd roared as the hit the turn, sealing the deal for the Frenchman. 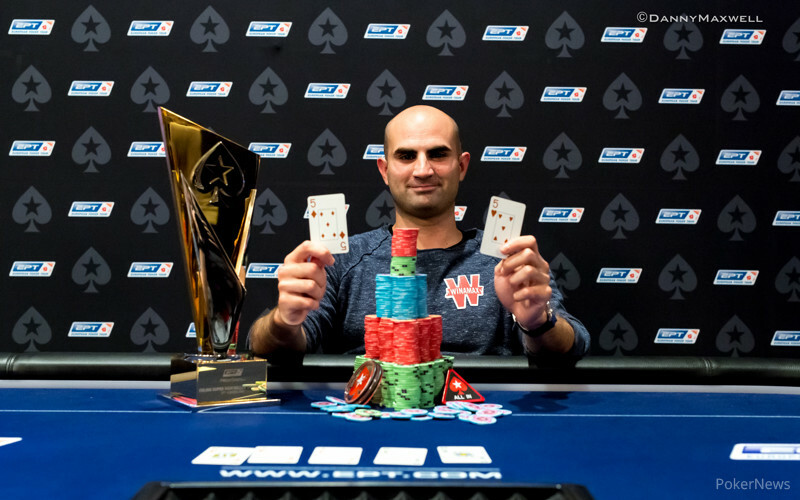 It meant Urbanovich would once again finish runner up in a Super High Roller, just like last seasons EPT Grand Final Super High Roller where hje finished second to Erik Seidel. The hit the river to give Loosli an even prettier looking full house, and he celebrated his victory by raising the trophy he was rewarded far above his head while the crowd went crazy cheering him on. With the blinds at an astronomical level right now there's not much room to manoeuvre for Dzmitry Urbanovich, and it shows in the gameplay. Urbanovich has been all in a few times, but he has not had any calls just yet. As of right now it seems be a waiting game before there's another all-in showdown. After covering Day 2 of the 2015 European Poker Tour Barcelona €50,000 Super High Roller, Remko Rinkema and Donnie Peters discuss languages, autocorrections, and the great deals at T.J. Maxx. They also find some time to preview Monday's final table. And don't forgot, fans can call in and leave a voicemail for the crew at 774-77-PNPOD. You can subscribe to the entire iBus Media Network on iTunes here, or you can access the RSS feed here. The PokerNews family of podcasts is now available on Stitcher. Sylvain Loosli's chip lead has grown since the start of the current level, and Dzmitry Urbanovich has just a bit more than 12 big blinds at the moment. The players are now on a 20-minute break. After some back and forth, Urbanovich was down to under 6 million again. Dzmitry Urbanovich limped in on the button and Sylvain Loosli checked his option from the big. The flop came and both players checked. The hit the turn and Loosli bet out 450,000. Urbanovich thought about it for a bit before raising to 1,075,000 with 4,515,000 behind. Loosli called. Loosli checked the river and Urbanovich checked behind rather quickly. Loosli showed and Urbanovich tabled . The chip stacks have not changed much since our last update, as the final two players are trading small punches. It's still anyone's game, even though Sylvain Loosli has the clear chip advantage. Who's Going To Be the Champion?